If you had told me a decade ago that I would waste an entire Saturday driving around downtown Mobile, searching for a muffuletta, I would have politely directed you to take a dip in Lake Pontchartrain. But the arrival of Mardi Gras season evokes an insatiable longing for the Crescent City. I need to be there. Since my bank account doesn’t agree, I did the next best thing — I decided to play tourist in my own backyard. That meant I had to eat from the Menu of the Holy Trinity: beignets, muffulettas, and po-boys. I’ll be honest — I’ve only had one muffuletta in my life, and I hated it. Now before you dismiss me as a heathen or, God forbid, a food snob, you have to understand: I was at Napoleon House in New Orleans, and I was beyond inebriated thanks to about five too many Pimm’s Cups. This should have been a recipe for blissful gluttony, but I was expecting a soothingly anemic club sandwich. My roiling stomach was woefully ill-prepared for anything involving olives. 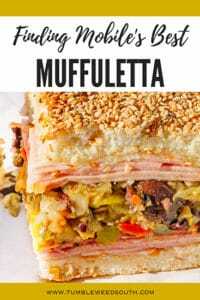 A muffuletta is a sandwich comprised of Italian meats and cheeses separated by olive salad. It’s traditionally served on round, Sicilian sesame bread and typically contains Genoa salami, smoked ham, mortadella, capicola, mozzarella cheese, and provolone, though other meats and cheeses may be substituted. 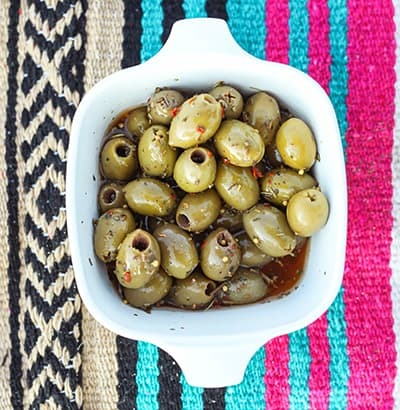 The distinct flavor comes from the olive tapenade, which varies from cook to cook but usually includes green olives, black olives, pickled vegetables, vinegar, and olive oil. No matter what you put on your sandwich, if it doesn’t have olives, it isn’t a muffuletta. According to legend, the muffuletta sandwich was invented in 1906 by Salvatore Lupo, the owner of Central Grocery in New Orleans. 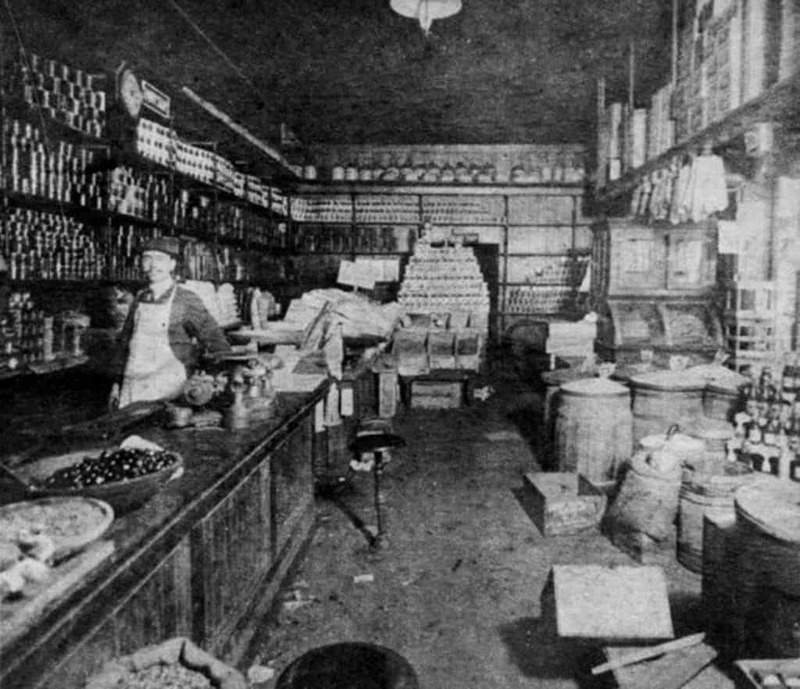 Local immigrants working alongside the riverfront often purchased muffuletto — a traditional Sicilian loaf bread — along with sliced cold cuts, olives, and cheese. It gave Mr. Lupo an idea: What if he used those ingredients to make a sandwich just for them? 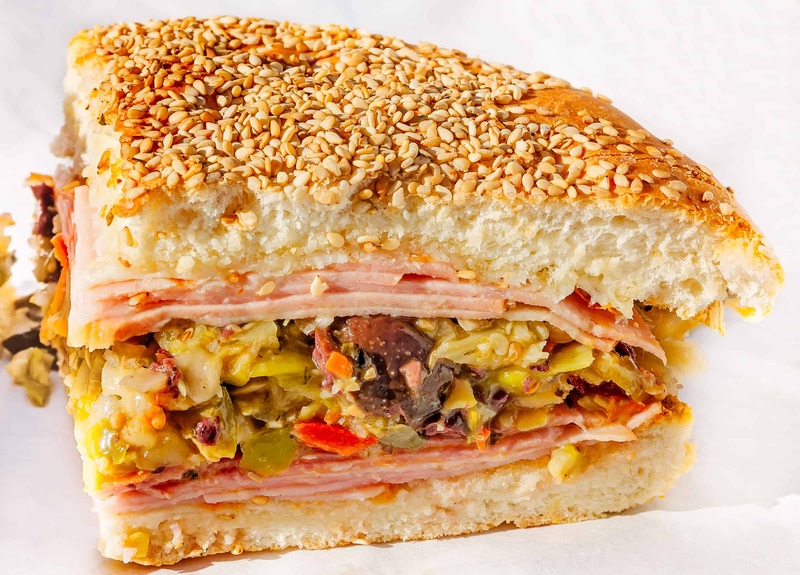 The muffuletta was born, and we’ve been fighting about it ever since. Some think it should be served cold, others say it should be hot, bolstering their argument by pointing out that the old bakers used to advertise the sandwich on the streets by yelling, “Muffuletto, Caldo, Caldo.” You might surmise, as I did, that “caldo” means “cold” in Italian, but you would be wrong. It means hot. Like the sandwich should be. 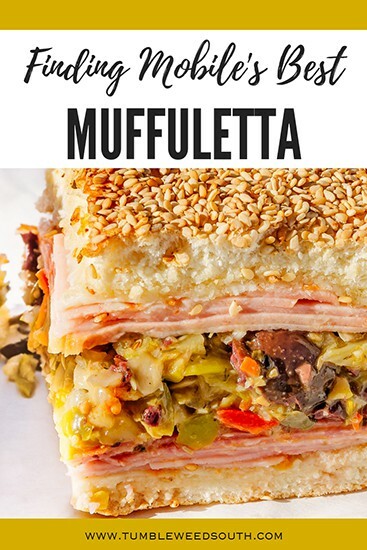 Likewise, you’ll see it spelled all sorts of ways.Webster’s Dictionary considers “muffuletta” the only correct spelling but grudgingly acknowledges that some people — ahem, the unwashed masses — might use the alternative spelling, muffaletta. 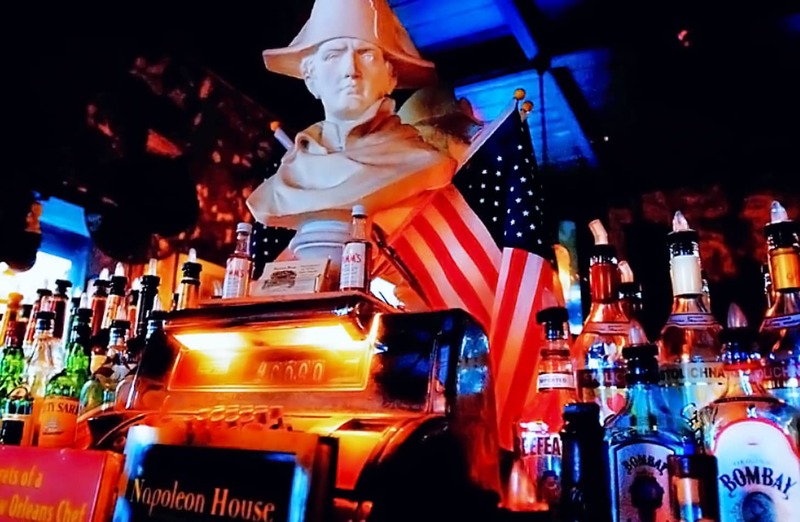 Let’s not talk about the people (cough, tourists) who walk up to the counter in New Orleans and ask for a “muff.” My guess is they don’t want to muff the pronunciation, and really, who can blame them. A recent interview showed a reporter being roundly chastened by a local chef for mispronouncing this food of the gods. So yeah. People take this thing seriously. The day started off badly when I woke up late with a splitting headache, but I was not to be deterred. If I were in New Orleans, I might very well have awakened in the same dire straits, so I grabbed my keys and decided to go with the flow. Almost immediately, I got lost trying to find Panini Pete’s — the only place I knew of in Mobile that sells the legendary muffuletta. I had misgivings to start with when I learned that the Panini Pete version of the famed sandwich re-envisions it in the unsurprising but utterly blasphemous form of a panino. I was on a mission though, so I was willing to give it a try. The directions to Panini Pete’s seemed straightforward enough: Drive down Government Street until you reach the History Museum of Mobile and turn left onto Royal Street. 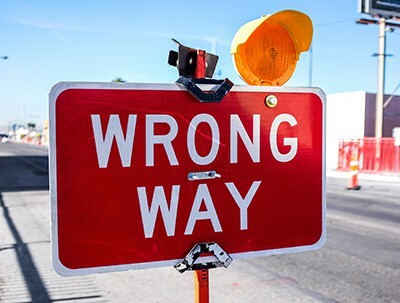 Unfortunately, since I was going to be turning left, I smugly plastered myself into the left-hand lane of Government Street and … promptly found myself unable to escape the horrendous maw of the Bankhead Tunnel. By the time I crossed Mobile Bay, crisscrossed my way back, had a major panic attack, and pulled over to consult Google, I realized Panini Pete’s was closed for the day. I almost gave up. 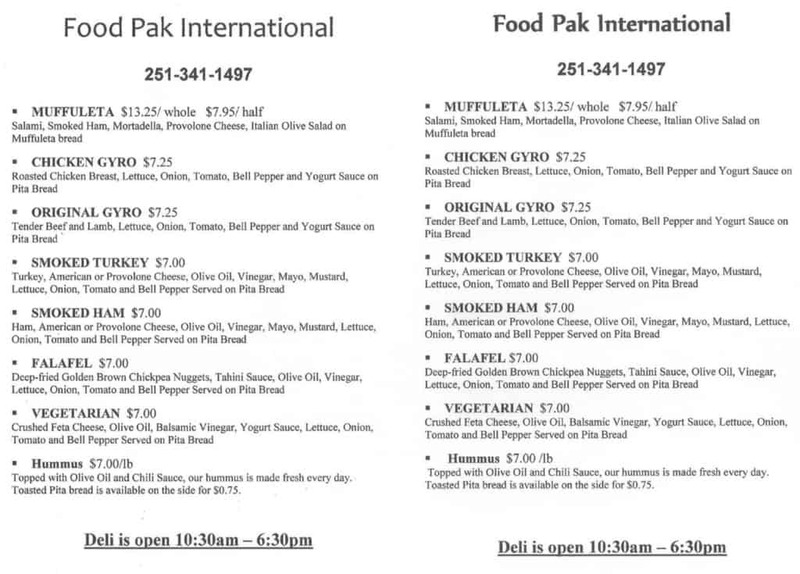 I consulted Google again and found that a convenience store called Food Pak also served a muffuletta. I wanted to go home, but I also wanted the sandwich I had so brusquely dismissed in New Orleans. So I dug my GPS out of the trunk and headed west. I nearly bypassed Food Pak because even though I knew it was a convenience store, I expected a Muffuletta Palace to be more prominent, with flashing lights, hordes of hungry people, a packed parking lot — anything to tell me I had found my muffuletta mecca. What I found instead was a low-slung brick building on Old Shell Road. A few picnic tables outside suggested I was probably in the right place. The outside of the building may be rather pedestrian, but the interior holds a global cornucopia worthy of much larger cities than Mobile. Owner Reza Hejazi, a native of Esfahan, Iran, is proud of the selection he offers, and rightly so. Since 1991, Mr. Hejazi has kept Mobilians well-fed and amply stocked with anything their food-loving hearts could possibly desire. 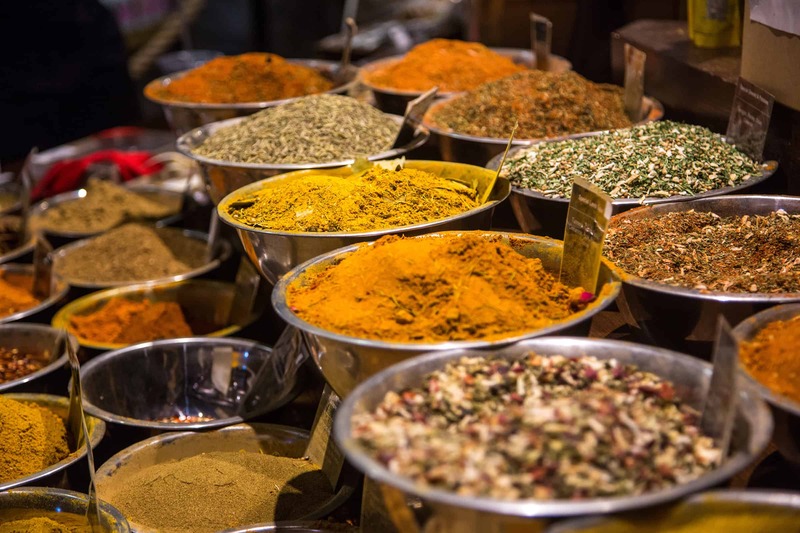 Towering shelves hold an astonishing array of well-organized spices, sauces, and delicacies from around the world. Looking for Turkish Delight? They’ve got it. Mochi ice cream? Yep. European marshmallows, Darjeeling tea, and tagliolini? Of course. If it’s an international food, you can probably find it there. On the back wall, there is a refrigerated case for cold foods, and you’ll also see a wide selection of wines and beers. According to Food Pak’s Facebook page, they hold occasional wine tastings, so if this is something that interests you, call and see if they’ll be hosting one soon. But for me, I only had eyes for the deli counter. I knew Food Pak had received high praise from online reviewers for the gyros, hummus, eggplant dip, tabbouleh, and falafels, but could they create a New Orleans muffuletta? It took about 10 minutes for Hejazi to make my sandwich, so I entertained myself by wandering the aisles, marveling at the staggering assortment of products. Though Hejazi holds a civil engineering degree from the University of South Alabama, he was unable to find a job in his field after graduation, which brought him on the circuitous route to Food Pak. As a child, he had worked in his father’s bakery, so a career in food was not so much a step down as it was a continuation of tradition. The sandwich was everything promised and then some. Spicy, pungent, messy, and almost mind-numbingly flavorful. If it’s not the best muffuletta in Mobile, it’s pretty damned close. Engineering’s loss was Mobile’s culinary gain. One look at the massive muffuletta and I had to admit — the beast was an architectural marvel. I ordered a whole muffuletta the size of a dinner plate, each quarter-slab approximating a beefy man’s oversized fist. A side of Zapp’s Voodoo chips and Abita root beer rounded out the meal because I wanted to do this New Orleans thing right. Approximately 1/2 the muffuletta disappeared so quickly that I forgot all about the chips and drink. I had planned to drive down the street and get a King Cake from Pollman’s Bakery, but I was so stuffed that I settled on a square of chocolate doberge (also a New Orleans thing) and bought an egg custard pie to take home. I’ll return to Pollman’s another day and do a proper story about them, and I still plan to sample Panini Pete’s take on the classic muffuletta. For now, I’ve sated my New Orleans craving. I expect it to peak again somewhere around Saturday morning, which sounds like an excellent excuse to get blitzed on beignets. Sun 10:30 a.m. – 6 p.m.
Mon – Fri 9 a.m. – 7 p.m.